The Waller Creek Conservancy stated the free family-friendly show will last for 9 nights, in a new location, with new experiences compared to past years. 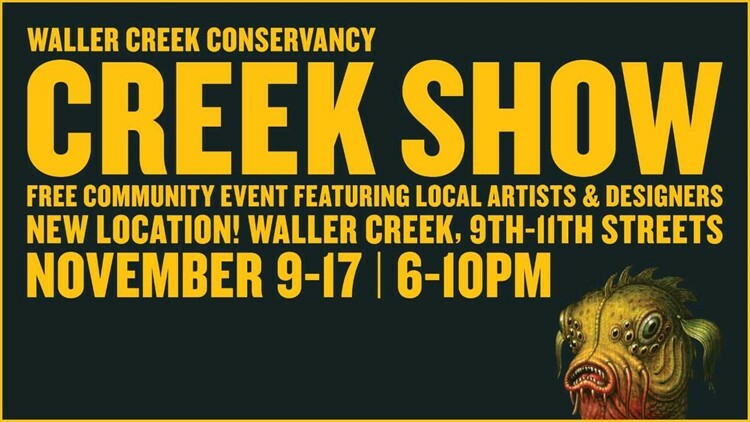 AUSTIN — Waller Creek Conservancy's Annual Creek Show is set to open Friday night. The Conservancy stated the family-friendly event will return for nine nights of free, light-based, site specific art installations along Waller Creek. This year's event will be from Nov 9-17, beginning at 6 p.m. and ending at 10 p.m. daily. The show will take place at a new location, between 9th and 11th streets, along Waller Creek. The Conservancy stated they chose the new location this year to showcase the renovated Symphony Square, which is the new home of the Conservancy. Not only did the Conservancy say there will be a new location, but the show will also have new experiences including a lounge and bar and free activities and games for the family on Fridays and Saturdays. A music stage will have a diverse line-up of Austin bands and the 'Creek Show Artist Talk' from 6 to 8 p.m. on Thursday, Nov. 15, at CB's Lounge at Stubb's.